Hal Roach-MGM, 1937. Directed by James Horne. Camera: Art Lloyd. With Stan Laurel, Oliver Hardy, Sharon Lynn, James Finlayson, Rosina Lawrence, Stanley Fields, Vivien Oakland, Chill Wills, The Avalon Boys, Mary Gordon. 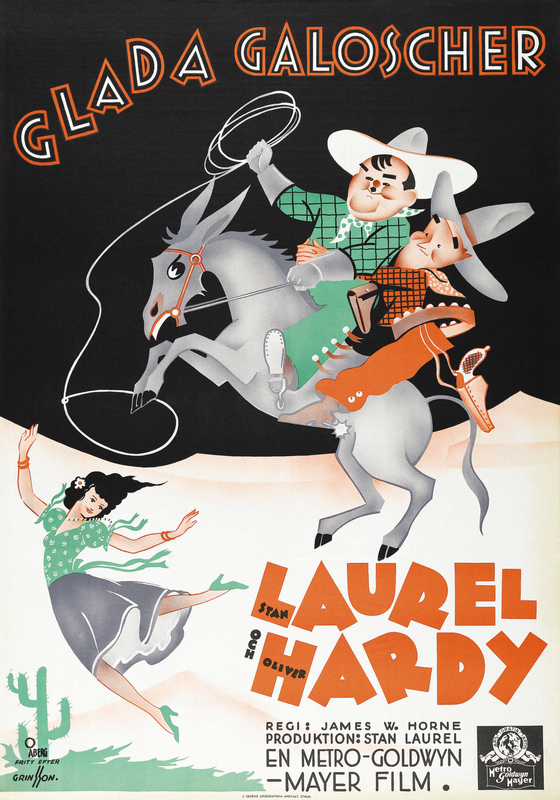 Laurel & Hardy come to Brushwood Gulch in the Wild West to deliver the deed to a gold mine to the daughter of a recently deceased partner of theirs. Their enquiries of saloon owner James Finlayson prompt him to palm off his brassy partner as the heiress, and taken in by her, they hand over the deed. Later they encounter the genuine heiress, employed as a kitchen maid in the saloon, and determine to get the deed back. Their initial efforts get them run out of town, but a final nocturnal foray into the saloon crowns their efforts with success. 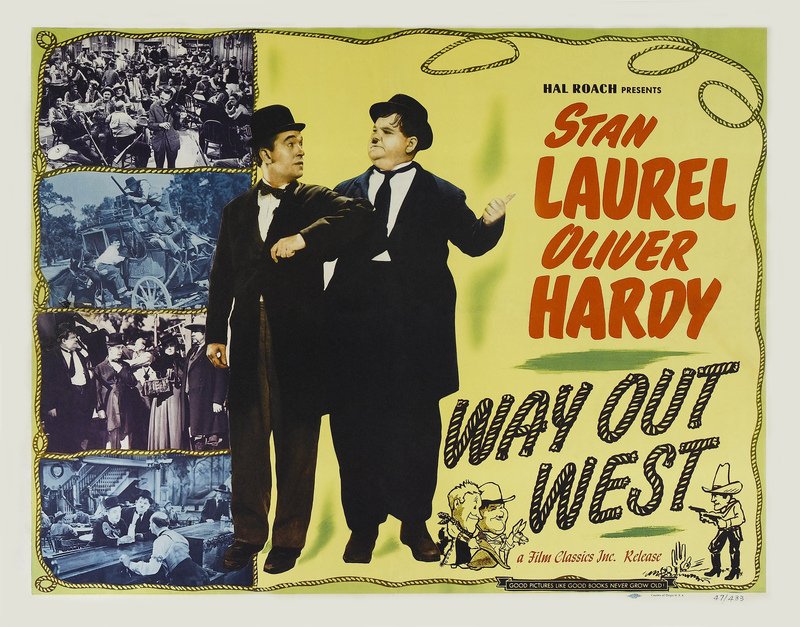 With the possible exception of Sons of the Desert, which was subtler if not funnier, Way Out West must rank as the best of all the Laurel & Hardy features. 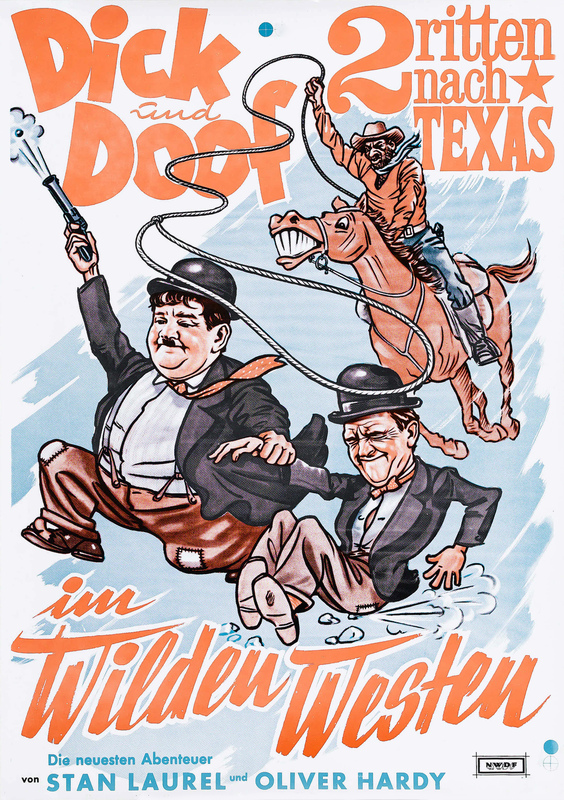 Not only is it pure, unadulterated Laurel & Hardy, with no time wasted on subsidiary plotting or romantic or musical "relief," but it is also a first-rate satire of the Western genre. Most such satires have usually consisted of putting a comic�Jack Benny, Bob Hope, Martin and Lewis, Abbott & Costello�through their customary paces against a Western backdrop, which is often not exploited at all. The Marx Brothers came closer to genuine satire with their Go West, and Laurel & Hardy, though denied the budget the Marx Brothers had and thus limited in their spoofing of spectacular action sequences, succeed perhaps best of all. Their characters are beautiful takeoffs on the standard wandering cavaliers, while James Finlayson, cast as Mickey Finn, outdoes himself as the epitome of double-dyed villainy, the sheer joy of chicanery almost outweighing the monetary rewards it will bring. Finlayson's direct stares at the audience, often done in direct counterpoint to Hardy's (Hardy would appeal for sympathy, while Finlayson's stares were aggressive, as if daring the audience to do anything with its knowledge of his own perfidy) here are extended and exploited as never before. As he outlines some particularly heinous piece of villainy, he rubs his hands, chuckles, leaps for joy and looks to the audience for admiration of his cunning; or as he tells some exceptionally outrageous lie, he stares at the camera with an exaggerated intake of breath, over-awed himself by his own skullduggery. There isn't a wasted moment in Way Out West. Even when the plot isn't being propelled forward, there are delightful little vignettes and the establishment of running gags. Early in the film, Laurel & Hardy, accompanied by their mule, wade through a river. Hardy's aplomb, and the position of the camera, tip us off to what is coming-and, sure enough, he steps into a hidden pot-hole, and plunges beneath the surface of the water. 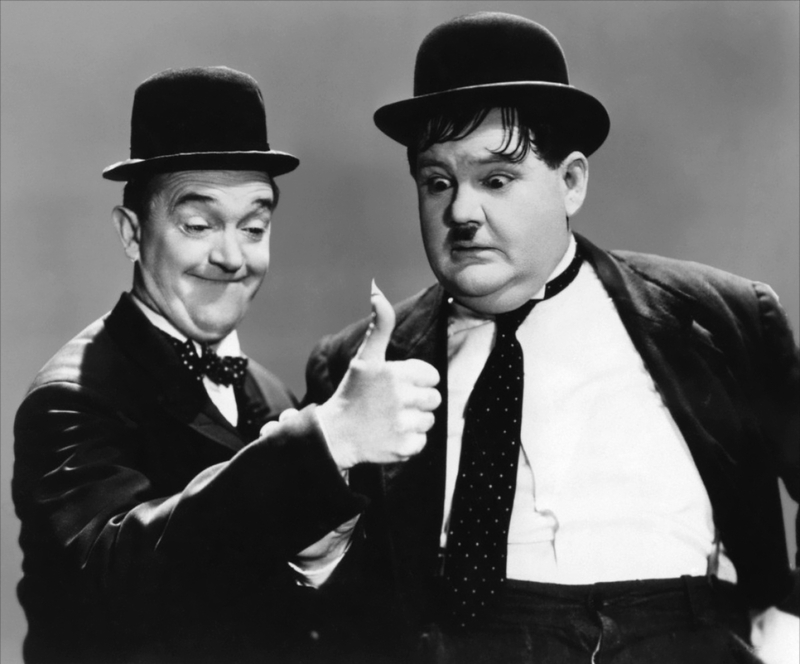 Familiarity was too much an essential part of the Laurel & Hardy format for it ever to breed contempt, and thus the gag works even better when it is repeated at the end of the film as a wrap-up, this time with the comedians walking away from the camera instead of towards it. An amusing, but admittedly rather protracted, early sequence in which they are confused by a signpost which the wind keeps shifting into different directions was never included in the U.S. release version, but was retained in the European prints. (Laurel & Hardy films, extremely popular in Britain and Europe, invariably played at the top of the bill, where the short running times were sometimes a handicap). Hitchhiking a stagecoach ride into town, Hardy engages the lone lady in the coach in some marvelous small-talk. "A lot of weather we've been having lately," he begins coyly, and adds asininity to absurdity, the convivial gallant and the intruding bore all rolled into one, while his captive audience smiles politely, hoping he'll shut up. Hardy of course is merely seeking to bring a little old-world grace and charm to this wilderness, and he is rudely taken aback when they reach their destination. The lady is met by her husband, the burly sheriff, who asks if she had a nice journey. Yes, she tells him, except for that awful man who bothered her from the moment he got into the coach. The sheriff gives the boys until the next coach to get out of town. With the plot proper not yet under way, Laurel & Hardy still find time to dally outside the saloon, and go into an extemporaneous and charmingly executed soft-shoe shuffle. It is performed in one long take, like a vaudeville routine, with an audaciously obvious back projection screen (cowboys, horses, wagons going about their business in the dusty street) immediately behind them. An unexpected bonus later in the film is a second such musical interlude when, as punctuation between two comedy episodes, the boys relax in the saloon and sing "In The Blue Ridge Mountains of Virginia," performed simply and pleasingly, easing into comedy only for its climax, when Laurel is hit on the head and switches from a shrill falsetto to a deep base. The first encounter with the bogus heiress provides some superb comedy. Laurel & Hardy, too trusting and good-natured to see through the sham sweetness and phony tears of the gold-digging impostor, are entirely taken in by her. Hardy has cautioned Stanley to break the sad news gently, but Stanley, unfamiliar with the ways of diplomacy, blurts out the news with a bald statement and seems pleased with his information. "Is my poor daddy really dead?" croons the bogus heiress tearfully, and Stan solaces her with, "I hope so-they buried him!" With dignity, Hardy rescues the delicate situation and hands over the deed to the mine. A family locket has to be handed over too, but this somehow has slipped into his shirt. Stan's efforts to help Ollie find it soon cause the pair to be hopelessly enmeshed in a tangle of shirts, buttons, and suspenders, while Hardy, by now in a state of unseemly dishabille, murmurs his apologies to the presumably genteel young lady, who is doing her best to express polite shock, while Finlayson's face can express nothing more than ill-concealed impatience. Their mission finally completed, however, the boys leave, only to run smack into the genuine heiress. Now in possession of all the facts, they rush back to Finlayson's room and indignantly demand the return of the deed. Finlayson and his crony, now revealed in their true colors, refuse and a wild free-for-all develops, with the deed being passed from hand to hand, and thrown across the room, like a football. For a time, the deed is safely in Laurel's possession, but the scheming saloon girl, in a reversal of cliched seduction scenes, chases Laurel into her bedroom, locks the door behind her, and throws herself on Laurel, who is cowering timidly on the bed. With the camera recording the titanic struggle from above, side and from under the bed, Laurel is finally defeated when the vamp resorts to tickling as a last measure, and immediately reduces him to a state of screaming hysterics. One of his funniest variations on their old laughing routine, it is one of the highlights of the picture. Rendered quite helpless by this onslaught, he is of no further use to Hardy�thereafter the girl has only to approach him and he collapses in hysterics again�and the deed, recovered by the villains, is locked away in their safe. Another brief period of repose provides the opportunity to develop some of the running gags a little further. One of the best involves Laurel's ability to snap his fingers and turn his thumb into a flaming torch with which he lights his pipe. Hardy, despite strenuous efforts, is unable to duplicate the feat, and finally gives it up as not being worth the bother. Of course, he achieves success when he least expects it a casual flick of his fingers later in the film (during a nocturnal foray after the deed) turns his thumb into a veritable flaming beacon! The longest single slapstick sequence is retained for the climax, when Stan and Ollie break into Finlayson's saloon at night. First comes the problem of climbing into the upstairs window, a problem solved�apparently�by a pulley system and a mule. As Hardy sails majestically upwards, Laurel tells him, "Wait a minute, I want to spit on my hands!" There is a moment's horrified realization for Ollie before he plummets downwards. Despite their attempts to be secretive, the howls of pain and ear-shattering sounds of collapse, collision, and destruction attendant on any Laurel & Hardy burglary venture, naturally arouse the nightshirted Finlayson from his slumbers. Racing up a ladder, Hardy is caught when the flap of a trapdoor falls squarely on, and over, his head, encircling it like a millstone. The door is jammed, and there is Hardy's head, emerging through the floorboards. Laurel grabs the head between both hands and yanks�and an elasticized replica of Hardy's head and neck is stretched some three or four feet before boomeranging back to its original position with a resounding thud. Finlayson's footsteps are getting nearer, so Stan hides Ollie's head under a convenient tin pail and scampers away to conceal himself. Finlayson leaps into the attic with a triumphant bound and surveys the scene with wide eyes and wrinkled-up nose. As he crosses the room, .he trips over the awkwardly placed pail. Annoyed, he aims a furious full-bodied kick at the offending implement. Thanks to Hardy's ample head being wedged inside, the pail refuses to budge, and Finlayson hobbles off, nursing his injured foot, while Laurel tomes out of hiding to ease the pail off his pal's somewhat battered head. The final confrontation takes place when the boys take refuge inside a piano, the tinkling notes tipping off Finlayson that something is amiss. Stealthily looking inside the piano, he spots his prey, and nods a confirmation of his discovery to the audience. Then he sits down and plays a lively jig, each dull thud on the keyboard telling him that he has hit home. Finally, the piano collapses in a jangling mass of wires and splintered wood, and the chase is on again, winding up with Finlayson first hoisted up to a chandelier and tied there by his nightshirt, and finally trapped in the steel shutters surrounding his saloon. 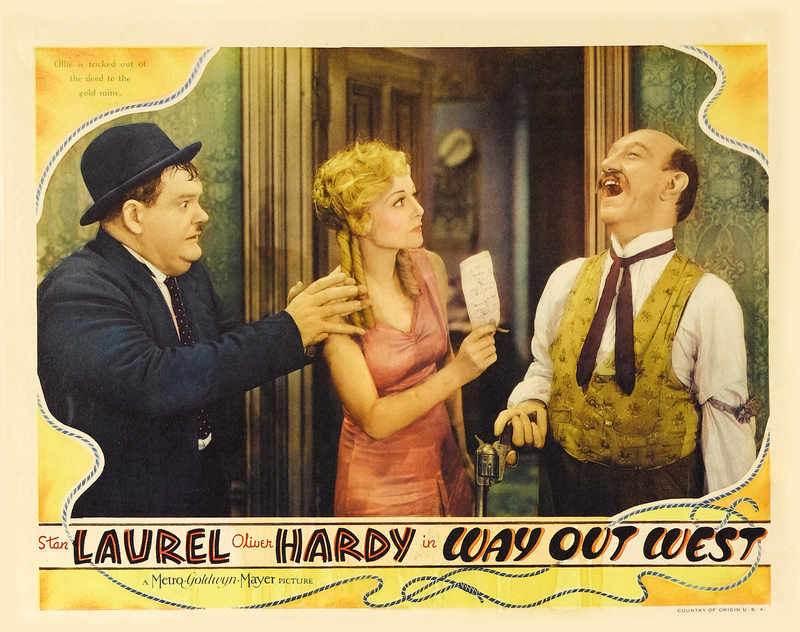 Way Out West is 100-proof undiluted Laurel & Hardy, and one of their best showcase vehicles. Even though it inevitably has certain echoes of previous films, it has no actual repetition of specific earlier gags, and is so crammed with incident that there is no time for those slowly-developed milkings of single gags which so often alienated non-partisans of Laurel & Hardy. Understandably, it was one of their best liked features.